When Hakeem Nosiru realized he had won $50-million in the Lotto Max draw on Jan. 17, he put the winning ticket in an envelope and duct-taped it to his body for safekeeping. That was on a Saturday. He might have avoided months of anguish if he had left it there until the Ontario Lottery and Gaming Corporation’s offices opened the following Monday. Instead, he gave the ticket to his wife to keep in her purse — “because she is more spiritual than me.” From there, it was lost. Thus began a two-and-a-half month search for the slip of paper that could change the lives of the Brampton grandparents. The woman had found their ticket — it had already been signed and included their address — and returned it to the grateful Nosirus. 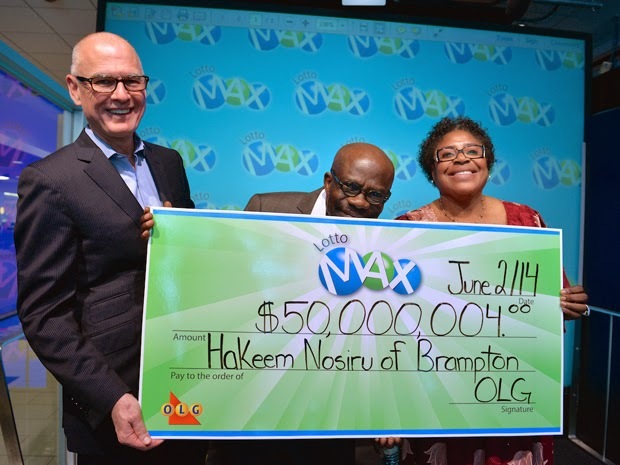 After a standard investigation, the OLG rewarded the couple with their $50-million winnings on Monday. were the valid winners even in the absence of a ticket. Ms. Nosiru did offer some advice to future lottery winners.